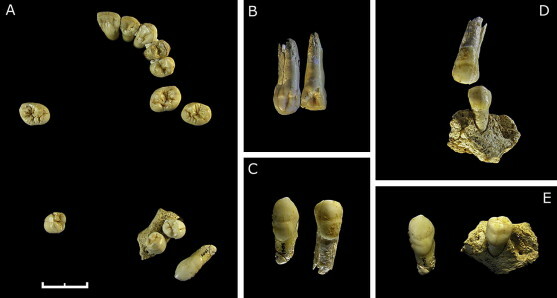 Abstract: Two Neandertal specimens from El Sidrón, northern Spain, show evidence of retained left mandibular deciduous canines. These individuals share the same mitochondrial (mtDNA) haplotype, indicating they are maternally related and suggesting a potential heritable basis for these dental anomalies. Radiographs and medical CT scans provide evidence of further, more extensive dental pathology in one of these specimens. An anomalous deciduous canine crown morphology that developed before birth subsequently suffered a fracture of the crown exposing the pulp sometime after eruption into functional occlusion. This led to death of the tooth, periapical granuloma formation and arrested deciduous canine root growth at an estimated age of 2.5 years. At some point the underlying permanent canine tooth became horizontally displaced and came to lie low in the trabecular bone of the mandibular corpus. A dentigerous cyst then developed around the crown. 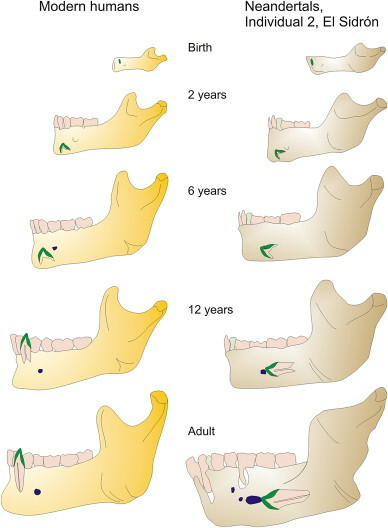 Anterior growth displacement of the mandible continued around the stationary permanent canine, leaving it posteriorly positioned in the mandibular corpus by the end of the growth period beneath the third permanent molar roots, which, in turn, suggests a largely horizontal growth vector. Subsequent longstanding repeated infections of the expanding cyst cavity are evidenced by bouts of bone deposition and resorption of the boundary walls of the cyst cavity. This resulted in the establishment of two permanent bony drainage sinuses, one through the buccal plate of the alveolar bone anteriorly, immediately beneath the infected deciduous canine root, and the other through the buccal plate anterior to the mesial root of the first permanent molar. It is probable that this complicated temporal sequence of dental pathologies had an initial heritable trigger that progressed in an unusually complex way in one of these individuals. During life, this individual may have been largely unaware of this ongoing pathology. Figure 1. El Sidrón Individual 2 hemi-mandible. Lingually, (top image) the root apex of the impacted permanent left canine is visible protruding through cortical bone beneath the M3 distal root within the submandibular fossa. Heavy calculus deposits are also visible around the premolar and molar cervix. Buccally, (middle right image) the large mental foramen is visible beneath M1 with two accessory foramina mesial to it. Above the mental foramen a large smooth-walled sinus has exposed the mesial root of the M1. The two higher power views below show the sinus tract rising up from beneath the P4 root (bottom right image) but also that some intact bone remains around the apex of the M1 mesial root (bottom left image). Anteriorly (middle image), a second buccal sinus opens deep beneath the socket of the I2 (now removed post-mortem) and this has coalesced with the apical granuloma surrounding the incomplete apex of the deciduous canine. Figure 5. 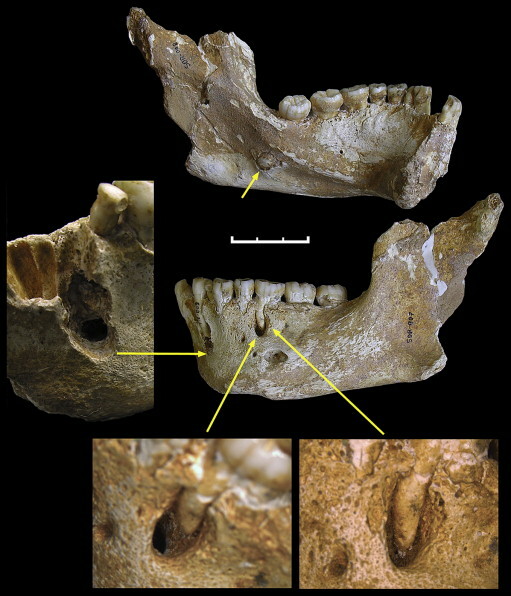 Dentition of Adolescent 3 from the El Sidrón site. A. – Occlusal view of the complete preserved dentition. B. – Dental wear of the upper left I2 and canine. C. – Buccal view of the upper and lower canines. Note the identical pattern of linear hypoplastic banding of upper and lower canines. D. – Occlusal fitting of the upper canine and lower first premolar, relating lower and upper isolated dental pieces. E. – Fragment of mandible in which the root of the deciduous canine can be appreciated. On the left side, a permanent canine without any sign of occlusal wear can be seen, denoting a non-erupted condition. Figure 7. Comparative growth series of mandible and canine development in Homo sapiens and the Neandertal, Individual 2 from the El Sidrón. Primary displacement and growth at the mandibular condyle results in lengthening of the mandibular corpus. The follicle containing the permanent canine tooth germ appears before birth just lingual to the developing deciduous canine. With vertical growth of the alveolus, the permanent canine usually comes to lie low in the corpus but remains vertically aligned. As the deciduous canine root is resorbed, the permanent canine then erupts into occlusion. In Individual 2 from El Sidrón, the permanent canine follicle became displaced in the alveolus very early in development tilting the axis of the tooth germ and its follicle anteriorly. Subsequent development of a cyst cavity surrounding the crown of the tooth, together with anterior growth of the mandibular body happening around it, left the permanent canine displaced posteriorly in the adult mandible low in the corpus beneath the M2 and M3 roots.